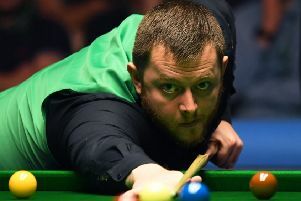 The “Wizard of Wishaw” kept up the scintillating form he had shown to reach the last eight in Glasgow to ease out the five-time world champion 5-2 and reach the semi-finals. In truth, O’Sullivan was far from his usual threat, but Higgins’ clinical nature stood out on the table at the Emirates Arena, building an almost unassailable 3-0 lead before closing out the match. “Any time you beat Ronnie is a special result for you, he didn’t play near his best and gave me a few too many chances, but any victory over him is a great achievement,” said the world No 3. “My all-round game was pretty good; my safety was solid and you need that when you play Ronnie just to be able to compete with him. Despite only having finished his quarter-final late on Thursday evening, Higgins instantly burst back into life yesterday. A superb long red helped him to a break of 88 and an immediate three-frame advantage. But a sublime pink from O’Sullivan helped him grab a foothold in the match by winning the last frame before the mid-session interval. Higgins restored his three-frame lead but world No 12 O’Sullivan stole a march on the Scot to win the sixth frame and it looked as though there was real contest in prospect. Higgins, however, turned on the style in the next frame with an impressive break of 104 to wrap up the contest. Higgins, the highest seed left in the competition after Stuart Bingham’s first-round exit, now faces Judd Trump or Robert Milkins for a place in tomorrow’s showcase final. Trump has looked in cruise control so far in Glasgow, dropping just two frames all tournament, with Milkins at this stage of a tournament for the first time since February. l Watch the Scottish Open LIVE on Eurosport 1 and Quest, featuring daily studio analysis from Ronnie O’Sullivan, Jimmy White and Neal Foulds.